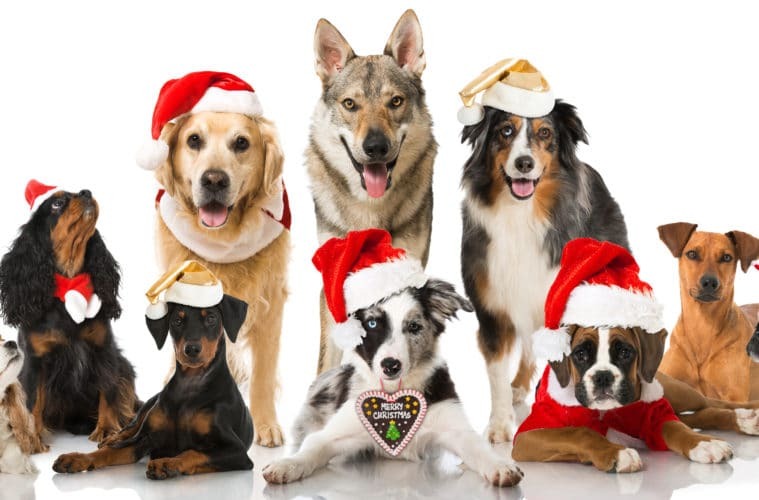 Protect your Pet from these 14 Holiday Hazards! The holiday season is a hazardous time for pets. Danger lurks on plates, in glasses, and on the tree; so savvy up to keep your pet safe. How much are you looking forward to the holiday season? 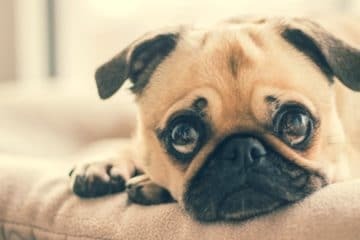 Amidst the excitement of decorations, gifts, and guests, don’t take your eyes off the ball when it comes to pet safety. The last thing you want is a blue light trip to doggie ER because your pet pal has a turkey bone lodged in his throat. To help you avoid other bloopers such as chocolate and decorations on the Christmas tree, be mindful of these holiday hazards to avoid. No Sugar Candies and Cookies: Having an eye on your waistline can lead to doggie disaster. The artificial sweetener xylitol is dangerous to pets as it causes a fall in blood glucose levels. The pet may slip into a hypoglycemic (ultra-low sugar level) coma which is fatal if left untreated. Keep those candies on a high shelf, well out of paws reach. Chocolate: Sad to say, chocolate is also a big no-no. It contains theobromine which is a powerful nerve stimulant to pets. The best case scenario is sickness, diarrhea, and over excitement; but the worst case is seizures and death. Sorry guys, but you need to keep the dog safe and eat all that chocolate yourselves. Alcohol: Ask guests to keep alcoholic drinks up away from the dog. The relative small size of dogs makes them vulnerable to inebriation and liver damage. Dried Fruit: Sultanas, raisins (and grapes) contain an as yet unidentified substance with the potential to damage dog or cat kidneys. For some dogs even a small amount can induce kidney failure, so contact the vet immediately if the pet ingests foods containing raisins. E-cigarettes: Be aware that the liquid inside eCigs is concentrated nicotine, which is deadly to dogs. Whilst relaxing after a hearty meal, be careful not to snooze and leave a cartridge where ideal paws can find it. Dogs Don’t Do Dough: There’s nothing quite like a home filled with the smell of fresh-baked bread. However, take care to keep the proving dough well away from the dog. Fermenting yeast inside a stomach is a recipe for bloat and an increased risk of gastric torsion. Turkey Bones: Nope, another kill-joy moment because you mustn’t let your pet chew on the turkey carcass. Those small bones are a choking hazard and could perforate the gut. 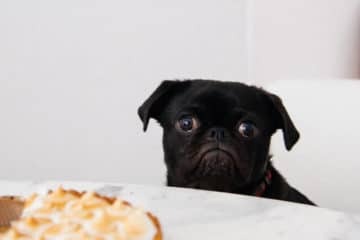 Onions, Shallots, and Garlic: The allium species can cause damage to the red blood cells, leading to anemia in dogs and cat. OK, a small lick of onion gravy is unlikely to cause a problem, but please don’t make a habit of it. Tinsel and Ribbons: What fun! 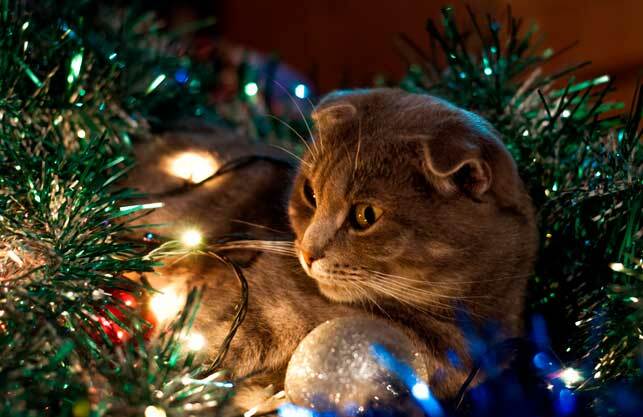 Your pet sees a snake glistening and twisting in the Christmas tree and pounces on it. The danger is the pet then swallows the tinsel, which tangles inside the gut requiring emergency surgery to remove it. The same applies to presents tied with ribbon. Fairy Lights: The glow of colored lights is especially festive, but it also represents a holiday hazard. The teething pup or determined chewer may chomp down on the electrical cable and be electrocuted. Be sure to tidy all cables away and cover them so that pets can’t get access. Glass Baubles and Decorations: Glass baubles are pretty, but a smashed decoration represents cut pads in the making. Either use shatterproof decorations or place glass ornaments high up in the tree. Christmas Trees: How exciting, having a tree in the house! Kitty tries to climb it, and the dog…well, does what dogs do. Watch out for pine needles that prick paws, by daily vacuuming. Also be wary of compost and even the run-off water, because this can contain chemicals that induce nasty sickness and diarrhea. 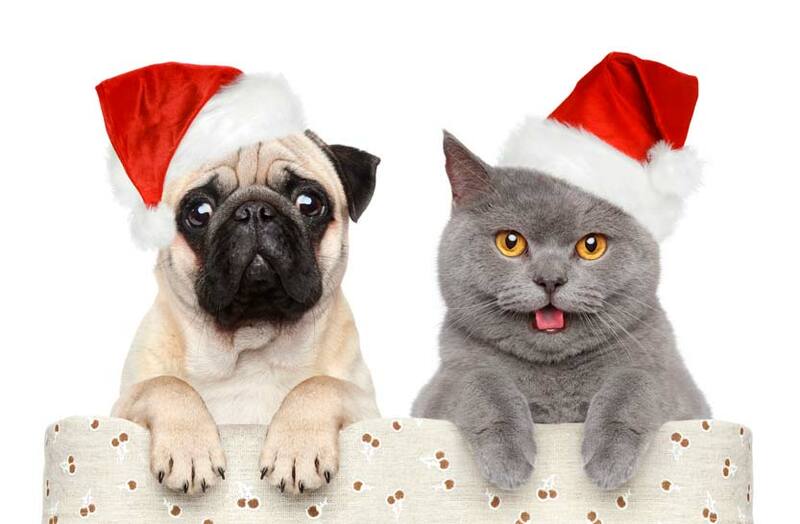 Poinsettia and Other Plants: Festive foliage such as holly and ivy, along with mistletoe and poinsettia, can cause holiday upset tummies or heavy drooling if your pet decides to snack on them. Best to keep the foliage high up out of harm’s way. Silica Gel: Not so much a decoration as something that comes inside presents, but none the less, those sachets of silica gel can cause serious problems to a pet if swallowed. Contact the vet as an emergency if the dog wolfs one down. 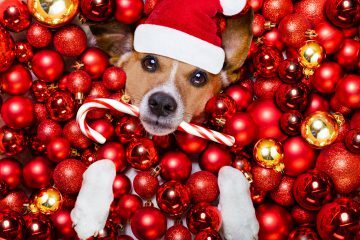 If this all sounds like bah-humbug, know that the holidays can be an unsettling time for pets: Their pet parent is distracted, walks get forgotten, meals slip off schedule, and strangers invade the house. However, it doesn’t take much to keep things positive for pets. Simply be aware of the potential stress they face and do your best to keep things in routine. 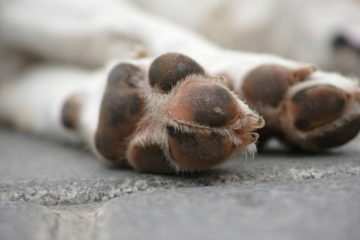 Make sure the pets get regular play or walks, and meals appear on time. 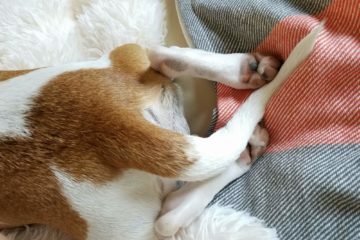 If they are anxious and dislike visitors, then set up a quiet room for the pet to retreat to and sleep out the worst of the disruption. Bear these simple tips in mind for a happy holiday season, for both two and four-leggers! 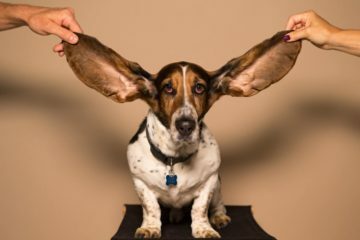 Previous ArticleCancer in Dogs: What are the Treatment Options?